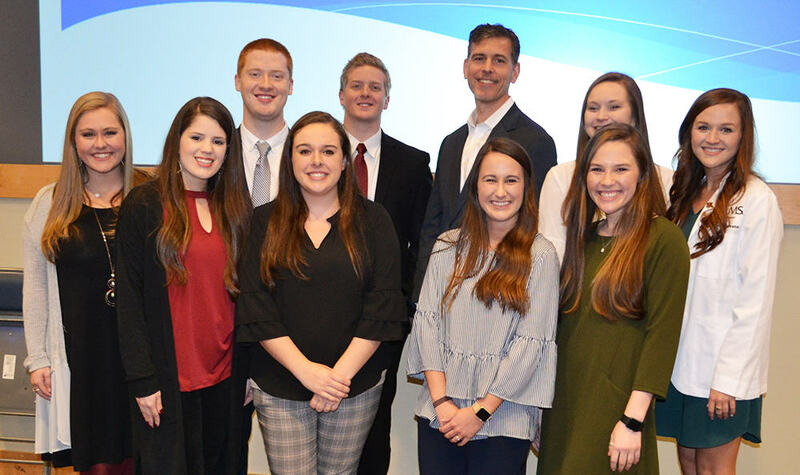 Doug Hoey, CEO of the National Community Pharmacists Association, visits with the leaders of the UAMS College of Pharmacy's NCPA Student Chapter. Feb. 6, 2019 | Feb. 6, 2019 | What makes Arkansas and Arkansas pharmacy unique among all other states are the personal and professional relationships that make up its strong social networks, said Doug Hoey, MBA. 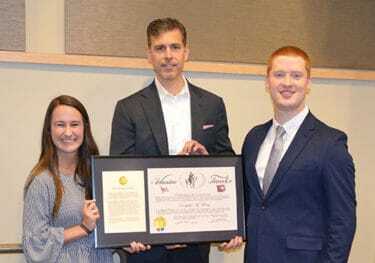 The student chapter presented Hoey, center, with an Arkansas Traveler certificate in thanks for his visit to UAMS. Hoey, who earned his pharmacy degree from the University of Oklahoma College of Pharmacy, practiced for five years in community pharmacies and is a licensed pharmacist. 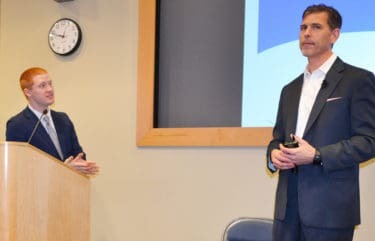 He is CEO of the National Community Pharmacists Association (NCPA) and spoke on Jan. 17 to the UAMS College of Pharmacy ’s NCPA Student Chapter. The chapter in gratitude for his visit presented Hoey with a framed Arkansas Traveler Certificate from the Office of the Secretary of State. Because of its social networks, Arkansas’ pharmacists and leaders are able to get things accomplished in legislation and public policy that other states struggle with, he said. That’s why Arkansas pharmacy is an example for other states to follow for models of pharmacy practice and drug legislation. NCPA Student Chapter President Cody Turner talks with Hoey near the end of Hoey’s question-and-answer session with the College’s faculty and students. Hoey spent most of his time answering questions from the audience of about 100 students and faculty. Hoey joked that studying and working for his MBA was a “walk in the park” compared to pharmacy school and learning medicinal chemistry. He’s optimistic about the future of pharmacy overall and that pharmacists will play a key role in filling in the gaps that exist now in the U.S. health care system. Before that happens, pharmacy will need to undergo some disruptive change, he said. The health care system will and must become more tightly integrated. What that new structure ultimately will look like Hoey said he couldn’t predict, but he’s certain pharmacy will play a pivotal part in defining it.